This is somewhat of an unusual case review from me as I tend to review those types of cases that I would look to use myself. If youâ€™ve read any of my previous reviews youâ€™ll know I favour the light touch, something that just protect the phone from scratches in the most minimal way possible. However, I decided to give the Crumena slim pouch SGS3 case from SGP a go, mainly as I was going on holiday and a pouch case seemed a good idea for protecting the phone whilst I was busy climbing volcanoes! You might not have heard of Spigen, or SGP for short, but they are a pretty big South Korean company specialising in mobile accessories. They have a reputation for focusing on design and quality, and you immediately get this feeling when looking at the case through the packaging. The small paragraph on the back of the box sort describes this better than I ever could..
Now, disregarding the small typo/misunderstanding of English grammar, you actually feel that tailored is the right word for this case. As mentioned in the title, the case is made from a premium leather,with the inner layer made up of a softer material to â€œprevent scratchesâ€. The leather exterior is as high quality leather as Iâ€™ve ever seen before. It manages to stay soft whilst also keeping a certain rigidity so the case never feels like itâ€™ll become malformed. Iâ€™m no expert on how to tell the quality of leather, but after 3 weeks of intense use, this one still has that out-of-the-box new leather smell and that must mean something! 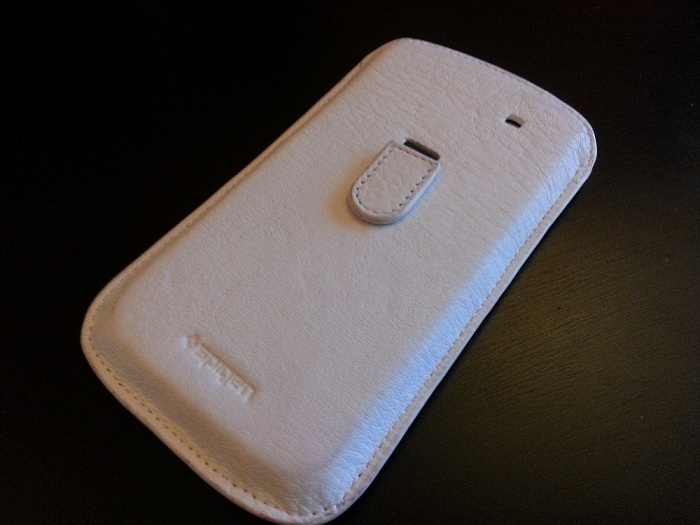 The best comment I can give for the general feel of this case is that it almost makes you never want to take your Galaxy S3 out to use as the leather feels so nice on your fingers! The case is also extremely lightweight as youâ€™d expect. The back of the case is imprinted with the Spigen name in small characters towards the bottom, whilst the Crumena text (the family of case) is indented in beautiful typography on the front. Both are nice additions to the overall look of the case and really add to the premium feel SGP are looking to portray with this case. It's a pouch case, and these offer some pretty decent protection from your phone when not in use. The other side of the coin of course is that this case will offer no protection at all when youâ€™re actually using your S3, being as it is a pouch case. The S3 fits in perfectly, with only the top of the phone visible whilst holstered. The top of the phone is pretty much flush with the top of the case, showing just how much precision SGP put into the design, it's actually quite impressive, especially when you compare it to a no-brand case you might typically purchase from eBay or the like. 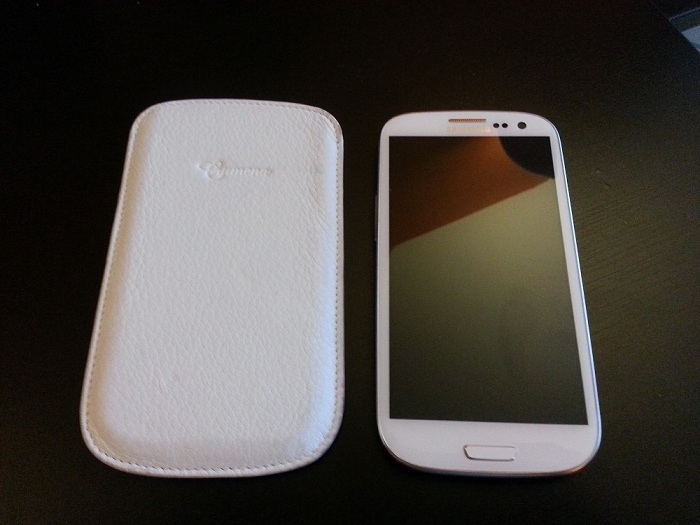 The case also contains a small leather tab on the back that you can use to release the phone from the case. The tab magnetically sticks to the back of the case while the phone is inserted to ease of use as well. The tab works well but sometimes does become tangled. As the case is soft, it wonâ€™t offer a high level of protection if you drop it, especially with regards to the screen. However, for general scuffs and scratches whilst not in use, you really canâ€™t get much better. A fantastically well-made and high quality premium case. Perfect if youâ€™re someone who uses your phone, then generally throws it in a bag or handbag. This will ensure your phone stays scratch free, as well as providing an extra bit of style to what is the premium phone right now. The price is relatively high, but in my mind, very good value for money! Big thanks to the guys over at MobileFunÂ for sending the Crumena case to us for review!